This villa is great for four couples, because each suite has a queen bed and private bathroom. There’s three beaches that are within a short walk or drive, and the villa is a perfectly cozy space to return to. 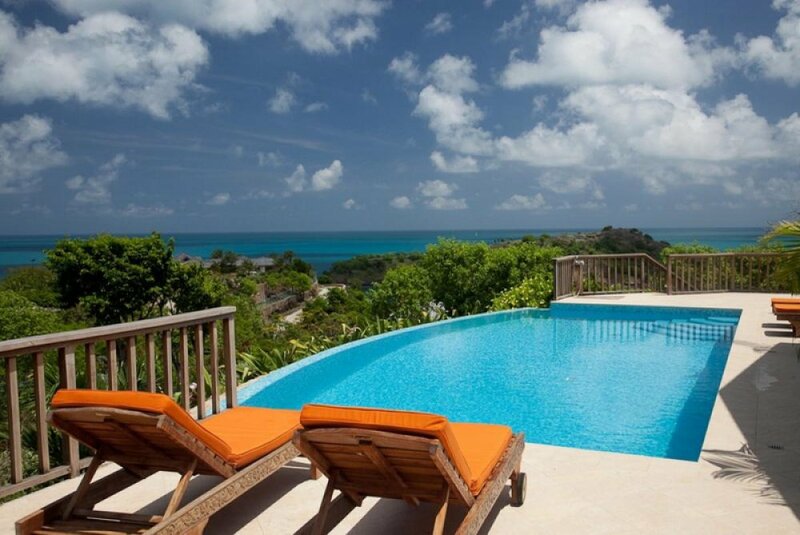 Galley Bay Heights Villa #007 is located on a hillside between two bays just outside Five Islands Village. It offers panoramic, romantic sunset views. The villa exhibits some of the finest architectural designs and sits in a lush tropical garden filled with colorful flowers and exotic plants. It’s infinity-edge pool pours over the stone deck, which holds loungers, an outdoor shower, and a dining table. An external bar with a professional BBQ sits around the corner. Galley Bay Heights #007 includes four bedrooms, a living room, internal dining areas, a gourmet kitchen, and a TV room. The living area is tastefully furnished with comfortable seating, and the formal dining area seats eight guests. This room has direct access to the kitchen and the veranda. The kitchen is equipped with state of the art appliances, smooth marble countertops, and gorgeous water views. The TV room has a large plasma screen, its own private bathroom, and air-conditioning. Three bedrooms are on the main floor, and one is on the lower level. All four queen bedrooms have walk-in closets, air-conditioning, mosquito nets, and ensuite bathrooms. The main floor suites have showers in their ensuite bathrooms, and the lower level suite has a shower and tub in its ensuite bathroom. Galley Bay Heights is a secluded, residential community located on the west coast of Antigua. The villa is only 10 minutes from St. John’s capital and 20 minutes from the airport. A housekeeper, groundskeeper, and pool team maintain the villa. The beach of Galley Bay is at a short walk distance or few minutes by car. The beach of Hawksbill is about an eight minute drive and the beautiful Deep Bay, the one you see from the property, is about a ten minute drive.